The Most Powerful Two-Channel Effects Processor You Can Buy. The Eventide H7600 provides 1100 preset-algorithms, 174-second sampler, and sorting capabilities for unprecedented stereo effects processing prowess. Eventide ®Harmonizer effects processors are considered “classics” by musicians and audio professionals. One reason is that Eventide doesn’t believe in planned obsolescence. Eventide gear has proven staying power over the decades as evidenced by the thousands of effects processors that remain in use. Eventide introduces a new model only when the state-of-the-art advances to the point that a major leap in performance is possible. 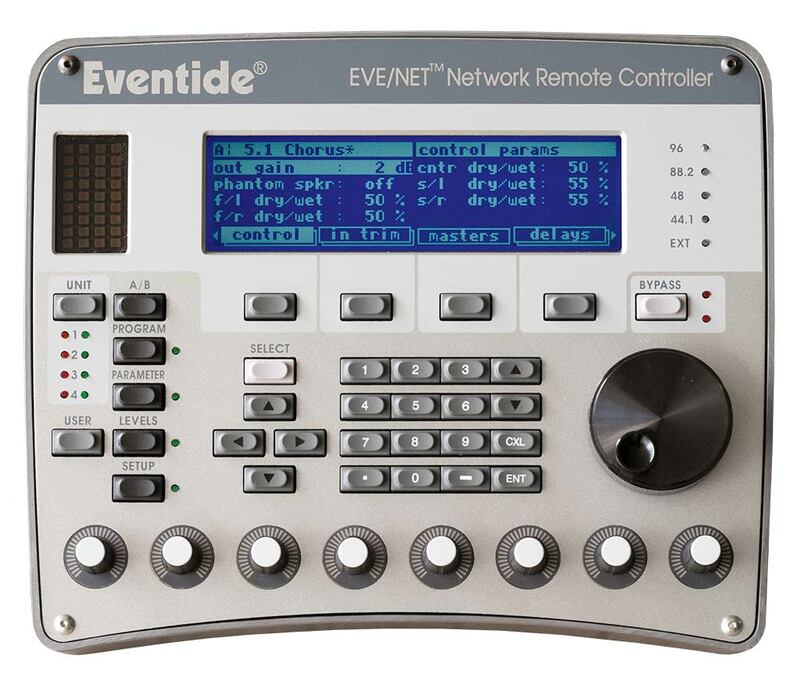 That time has come and the Eventide H7600 is that product. The H7600 builds on the rich heritage of Eventide’s world-class H3000/DSP4000/DSP7000 series. With more processing power than its predecessors, the H7600 is the most powerful two-channel effects processor you can buy. More capabilities and better performance – the densest reverbs, lushest choruses, and highest quality pitch change ever. An enhanced user interface adds search capability so that the Eventide H7600 is even faster and easier to use – in the studio or on the road. The Eventide H7600 Ultra-Harmonizer effects processor brings you one step closer to stereo effects Nirvana. Reverb Paradise – Award-winning acoustic spaces World-class reverb lives and breathes in the Eventide H7600. Stereo versions of the reverbs which earned Eventide the coveted Best Reverb Award from Studio Sound magazine are included the Eventide H7600. Dozens of new environments ranging from “Car Window” to mall spaces, big halls, plate reverbs, arenas, rooms, chambers, and even the “impossible” reverb we call “Black Hole” are found in the H7600. Whether it’s large or small, real or imagined, there’s a reverb for every musical genre and every post-production requirement. An Architecture You Can Build On – Create your own signature effects Ordinary processors have a limited number of processing algorithms. Their programs and presets can only be variations of that limited repertoire. In sharp contrast, each of the Eventide H7600’s 1100 factory preset-algorithms are created from a wide array of effects building blocks — over 230 in all. 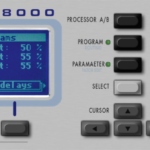 In the H7600, each preset is its own unique algorithm. Create your own unique effects from the front panel, or using the included VSIG (Windows) or VSIG-X (Mac OS-X) development tools. Copious Sampling With Time Compression/Expansion – Sample, stack, stretch & more The H7600 puts a highly flexible 174 seconds mono (87 seconds stereo) sampler at your fingertips. With stereo looping and multiple sampling capabilities, you can stack several samples and independently edit them, pitch shift, and/or time compress or expand them. Tap tempo looping adds to the versatility. From dance remixes to nuts-and-bolts radio and post-production, the H7600 sampler gets the job done. Post-Production And Broadcast Essentials – The complex made simple Broadcast and post-production professionals will find special utility in the Eventide H7600’s unique program presets created by sound designer Jay Rose. Instantly conjure up scores of audio environments which would otherwise take forever to achieve. Press a button and it’s “This is your captain speaking.” Press again and it’s the kid at the fast-food drive-up window. Another press and your words are coming from a computer chip-driven toy, or the TV in the next room, or a cellular phone. Myriads of fantasy or cartoon voices beckoning you to fairylands or to the “dark side of the force” are at your fingertips. Odds are that you’ve heard some of these Eventide effects on TV, radio, or at the movies in the past week. And Now Midi Virtual Racks- Stacked effects with instant program change The Eventide H7600 offers 20 MIDI Virtual Rack preset-algorithms, featuring up to five full-blown effect processors ganged together. Each preset offers 10 different tweaks which can be programmed, stored, and controlled in real time through MIDI. Up to forty-five different parameters can be controlled with one MIDI control message. Individually optimized for guitar, vocals, or percussion, and designed with performance in mind. Single effects blocks are also offered as separated presets so that effect chains can be assembled. Ultrashifter™ – The apex of pitch manipulation The Eventide H7600 incorporates Eventide’s most advanced formant-maintaining pitch shifter optimized for the human voice. The UltraShifter’s real-time adaptive resynthesis allows for unmatched modification of vocal timbre. So, if you are changing gender or going for something completely bizarre, it’s in there. Choose Eventide Eventide has packed so many unique and eminently useful preset-algorithms into the Eventide H7600 that this brochure can’t begin to detail them all. We haven’t neglected the classic Eventide effects that make audio pros covet even the oldest Eventide boxes. The Eventide H7600 includes the many wonderful, classic Eventide effects heard on hit records, in major motion pictures, and TV and radio productions over the past thirty-five years – each in a variety of flavors, all in a single box. Eventide pushes the limits of what’s possible today with a clear vision of what will be possible tomorrow.